Santiago, Chilean trio BOLIDO formed in 2010 as a Hard Rock/Heavy Metal act. 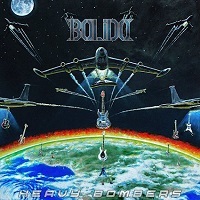 In English, their name translates to “meteorite.” “Heavy Bombers” is the band’s second full length release, and contains eleven tracks. The opening track is a bit of an opus, at over eight minutes in length. It builds slowly, wanting that grand entrance. The main riff hits hard, with high pitched Power Metal vocals and a galloping rhythm. With a NWOBHM influence, you could be listening to early JUDAS PRIEST. “War Machine” has that old school riff; a sound somewhere between Classic and Power Metal. It’s an energetic number that is fueled by strong axe work and vocals. “Rock ‘N Roll Days” is a mid-tempo song that swings with a groovy rhythm. Its accessible sound makes for a good anthem. The title track pushes a big chorus in a weighted number where the bass guitar is the glue to the sound. It thumps along like the footsteps of a giant and keeps a steady pace to guide the track. “Win Lose or Draw” is as jovial as it sound…an energetic and fun riff and vocals that talk about in the “game of life” there are winners and losers. If you were waiting for that “power ballad,” “Real Nature” is pretty close. It opens with pensive vocals and clean guitar notes, with a dancing bass guitar line that follows the main melody line. It picks up with a little more sonority later on, but remains a fairly emotional piece. The saxophone solo was definitely a surprise. “Supersonic” is as it sounds; a fast moving song with thunderous double bass and riffs picked with haste. Trivino’s vocals can turn dangerous on a dime, reaching far high. It’s another anthem of sorts; something to get you fired up and pump your fists in the air. “Revenge” is the last track before the short closing reprise. As the subject suggests, it has a heavy and tough sound with a fiery bite. The reprise at the end is an instrumental recap of the first track. Overall, this was an enjoyable album. The band has a lot of energy and resolve, and you can tell they put attention into their music. As far as relevance to the current state of music, it doesn’t offer anything new, but they do inject their own flair into the album. If you are a fan of the classic Heavy and Power Metal days, it should fit nicely into your collection.